We offer our customers the complete service, from taking down your old garage/shed to erecting your new one, which can often be done the same day, saving you valuable time and money. Initially you will receive a free survey from one of our directors. Unlike many of our competitors we don’t always insist you have a new base for your garage. If it is looking a bit worse for wear we can often arrange to repair it, saving you hundreds of pounds. If a new base is required, then no worries, we have a team of skilled professionals who can provide this at highly competitive rates. 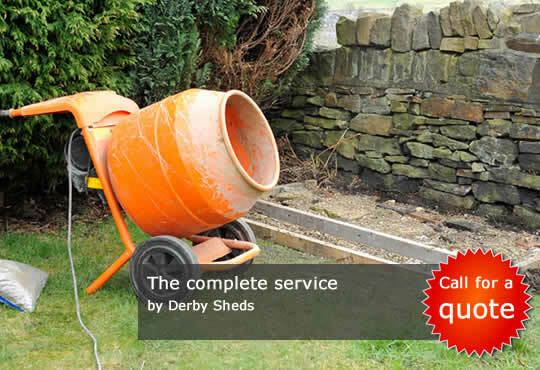 Our basic aim at Derby Shed and Garage Company is to ensure we provide a high quality personalised service to meet all your needs whilst ensuring you don’t encounter any unnecessary costs.